Intracranial hypertension and severe lung damage may coexist in a variety of clinical settings and pose a difficult challenge, especially in mechanical ventilation management. The two conditions may be caused by the same pathological insult, one be the cause of the other, negatively affect each other in several ways, and in any case may present conflicting therapeutical needs (Fig. 1). This occurs mainly in the context of multiple trauma with severe traumatic brain injury (TBI) , but also in patients with subarachnoid hemorrhage  and acute liver failure . Acute respiratory syndrome (ARDS) represents altogether a common in-hospital complication after admission for TBI, reaching more than 20% in the adult population . Many ventilation strategies commonly used in patients with ARDS are potentially associated with an increased risk of intracranial hypertension. In particular, the use of positive end-expiratory pressure (PEEP), recruitment maneuvers (RM) and prone positioning (PP) can have undesirable effects on cerebral physiology, by impeding cerebral venous return and decreasing mean arterial pressure (MAP); furthermore, lung protective ventilation (aiming at airway plateau pressures < 28–30 cmH2O, driving pressures < 14 cmH2O or delta transpulmonary pressures < 10–12 cmH2O) may cause hypercarbia, that may result in intracranial pressure (ICP) increases by aggravating a preexisting alteration of cerebral autoregulation . These ARDS ventilation strategies therefore carry a high potential risk for iatrogenic secondary brain damage [5, 6]. Other clinical conditions, even without reaching the severity of ARDS, may pose cerebral protection in conflict with the need of moderate-high PEEP levels. Neurogenic pulmonary edema is a well-known complication of subarachnoid hemorrhage , that may represent such a circumstance. Even ventilating an obese neurocritical patient will inevitably raise the conflict between the need to keep the lung open with higher-than-usual PEEP levels  and to minimize any hindrance to cerebral venous return. Continuous positive airway pressure has in fact shown to carry the risk of decreasing cerebral perfusion pressure (CPP) and cerebral blood flow (CBF) in both healthy volunteers  and brain-injured patients . However, existing data on this phenomenon are conflicting, and must be interpreted with caution. In a first study , the drop in CPP and CBF was due to hypocapnic vasoconstriction and not directly related to PEEP. Moreover, the PEEP applied was higher than commonly used in clinical practice and not titrated according to respiratory mechanics. Finally, population studied was composed of spontaneously breathing patients, and the results cannot be assumed to be applicable to deeply sedated patients on invasive mechanical ventilation. In another study , alterations of CPP were secondary to MAP reduction and not directly related to PEEP application, but lack of PEEP titration makes the interpretation of data difficult. Indeed, while properly titrated PEEP can improve cardiac output, especially when left ventricular failure coexists with brain injury, excessive PEEP exposes to lung over-distention and right ventricular impairment . Some authors demonstrated that if PEEP values are below ICP values, then the associated augmentation of intrathoracic pressure does not result in increased ICP . Also, when increased PEEP is applied to brain-injured patients with ARDS, there is a substantial difference in the effects on ICP, depending on whether the application of PEEP causes alveolar hyperinflation or alveolar recruitment and therefore on lung stiffness . Consequently, it is currently unknown which is the optimal level of PEEP in acutely brain-injured patients . Similarly, prone positioning and recruitment maneuvers can increase ICP  and their use in brain-injured patients must be weighed in light of the beneficial improvements in oxygenation and gas exchange, which could by far exceed the negative effect of increases of ICP. In essence, whatever ventilatory adjustment/manouvre may positively or negatively affect ICP in the neurocritical patient, based on its final repercussions on PaO2 and on CPP, according to the baseline conditions of cerebral autoregulation. Recent advances in critical care ultrasound have shown the wide use and clinical impact of point-of-care ultrasonography in critical care units  as well as the utility of a multimodal, integrated approach . International evidence-based consensus on point-of-care lung ultrasound (LUS)  recommends its use to track changes in aeration of lung parenchyma, by providing a semi-quantification [18, 19] of these changes and hence monitor lung disease evolution. Several are its applications. 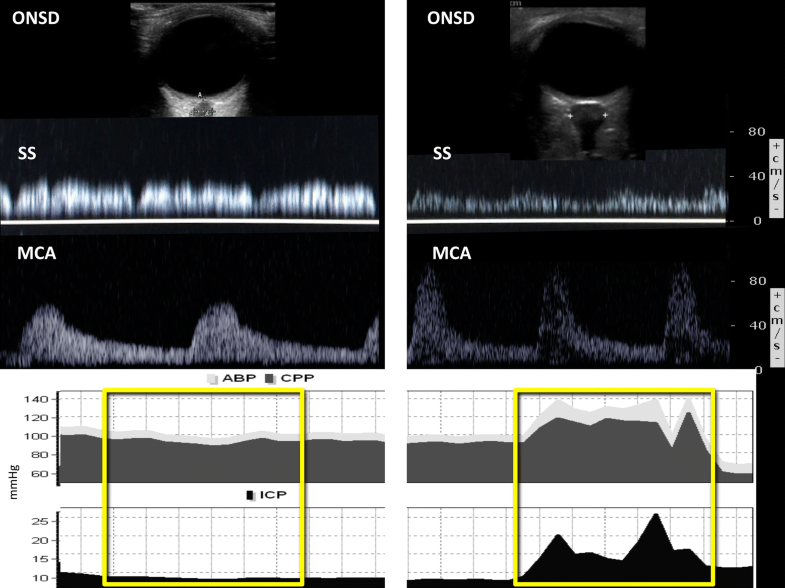 LUS can easily characterize morphologic features of ARDS , discriminate between focal and diffuse ARDS, and provide a picture of the heterogeneity of aeration distribution : focal ARDS is characterized by a normal LUS pattern in upper anterior and lateral lung regions and consolidation or B-lines in lower posterior and lateral ones (dependent lung regions in supine position); in diffuse ARDS, which is present in a minority of patients, aeration loss is homogeneously distributed among lung regions, with a diffuse ubiquitous LUS B-pattern. Overdistention cannot be directly measured by LUS and this represents its greatest limitation, although a reduction of physiological lung sliding in anterior regions may be observed when airway pressure is too high . A simple qualitative LUS evaluation has the potential to predict the occurrence of ARDS in blunt trauma patients , and predict the response to PEEP-induced lung recruitment and PEEP-induced increase in PaO2 in ARDS patients . Although the same LUS global reareation score applied to ARDS patients failed to predict the response to pronation in terms of oxygenation improvement, basal ARDS morphology described by means of LUS before pronation (focal vs. diffuse morphology) was predictive of effective reareation of dorsal areas, of immediate PaO2/FiO2 improvement and pCO2 decrease [25, 26]. LUS has also proven utility in discerning different degrees of disease severity at a very early stage of ARDS . Finally, it has been demonstrated to accurately track changes in EVLW, through a bedside quantitative approach [17, 19, 28, 29]. Brain ultrasonography, including transcranial Doppler (TCD) and the measurement of optic nerve sheath diameter (ONSD), is an evolving technique that has shown promising results in adult [30, 31] and pediatric populations  for the non-invasive assessment of ICP (nICP), cerebral perfusion pressure (CPP), as well as for the calculation of advanced parameters such as critical closing pressure and cerebral compliance . Although the invasive intracranial catheter remains the gold standard for ICP measurement, these methods could be helpful when invasive tools are not indicated (i.e., milder than severe degrees of traumatic brain injury) , contraindicated (patients with hemostatic disorders) or unavailable (such as in general intensive care) . Increased intrathoracic pressure and consequent ICP elevation produces specific changes in cerebral arterial blood flow velocity (FV) waveform that can be assessed by decreases in the diastolic FV and increases in the pulsatility index (PI = systolic FV − diastolic FV)/mean FV). In mild to moderate TBI, values of PI > 1.25 or a diastolic FV < 25 cm/s are considered pathological, and associated to secondary neurological deterioration [34, 35]. Increases of ONSD above a cut-off of 6 mm strongly suggest an increased ICP > 20 mmHg [36, 37]. Venous TCD provides further information. A reduction of venous FV at the level of the straight sinus (with a cut-off of 38.50 cm/s) has proven to be a good predictor of ICP above 20 mmHg . Therefore, it is intuitive how this index could be useful in neurocritical care patients with challenging mechanical ventilation conditions, where an important pathophysiological mechanism for ICP increase is related to venous return impairment caused by increased intrathoracic pressures. In a recent study, TCD and ONSD were tested as surrogate non-invasive measures of ICP changes during prone position and/or PEEP in non-brain-injured patients undergoing spine surgery : mean ONSD increased significantly upon prone positioning and upon a PEEP application of 8 cmH2O, suggesting that these methods may be applicable in the clinical practice to non-invasively monitor cerebrovascular changes during prone position and PEEP increase during mechanical ventilation. ONSD measurement in the prone position can be easily performed by one operator while an assistant holds the head rotated 30 degrees rightward (to measure the right ONSD) and then 30 degrees leftward (to measure the left ONSD) . Similarly, BUS can detect relevant changes in cerebrovascular dynamics associated to ICP increases upon recruitment maneuvers (Fig. 2). In particular, transcranial Doppler has a primarily role in the evaluation of alteration of cerebral blood flow associated with changes in intracranial pressure. However, although data about venous TCD and ONSD are limited in this group of patients, we believe that the use of these complementary techniques should be included in a thorough multimodal brain investigation, but not substitute for it, as they enable to assess cerebral haemodynamics from different perspectives. Therefore, especially in circumstances when invasive ICP pressure may carry excessive risk, be unavailable or contraindicated, BUS has the potential to provide understanding on whether PEEP, recruitment maneuvers or prone positioning are causing pathological changes in cerebral hemodynamics. Whenever a patient presents brain injury and requires mechanical ventilation, particular care is recommended in the setting and monitoring of airway pressures and of minute ventilation . The combined use of Lung ultrasonography (LUS) and Brain ultrasonography (BUS) could potentially be used to guide mechanical ventilation and at the same time monitor concurrent relevant cerebrovascular physiology, addressing relevant clinical targets: recruitment maneuvers tolerance, choice of the appropriate PEEP level, minimum tolerable minute ventilation. To tackle the challenging issue of combined lung and brain protection from secondary damage in the brain-injured patient under demanding mechanical ventilation, a pragmatic approach to orient mechanical ventilation settings based on LUS and BUS can be proposed, as part of the multimodal, multi-organ monitoring of such complex patients. This approach is based on the concept of noninvasively screening for the potential of a reduced tolerance to ventilatory maneuvers (BUS signs of high ICP/reduced cerebral flow), and of monitoring the cerebral effect itself of the ventilator maneuvers once performed. Where ICP invasive monitoring, that should be considered the gold standard, and other brain monitoring tools are already in place, this approach would represent a complimentary simultaneous assessment of lung recruitability/effective recruitment, screening for the potential of a reduced tolerance to ventilatory maneuvers (BUS signs of high ICP/reduced cerebral flow) and brain response to ventilatory manipulations. When ICP invasive monitoring is not indicated, contraindicated or not available, the combined LUS–BUS approach may represent a non-invasive monitoring tool instrumental to tackle the double challenge of concomitant lung- and neuro-protection in mechanically ventilated patients. A four-tiered LUS–BUS approach to the most severe setting of ARDS in TBI is here presented as example of this concept (Fig. 3). Essentially, a tailored PEEP-trial is performed under guidance of respiratory mechanics/monitoring parameters [driving pressure (ΔP), Respiratory System Compliance, SpO2, Volumetric Capnometry], and its effects are then monitored with LUS  and BUS . The first step is the evaluation of lung morphology at a PEEP of 5 cmH2O. This can be done by examination of anterior and dorsal chest areas: the presence of a prevailing normal A pattern  or scarce B-lines in the anterior areas, and consolidations in the dorsal ones characterizes focal aeration loss; conversely, if diffuse multiple well-separated or coalescent B-lines (B pattern)  are found in anterior areas of the chest, a diffuse, more homogeneous loss of aeration is demonstrated. The second step focuses on the screening for BUS signs of intracranial hypertension: should these be detected (thus making the PEEP-trial more likely to adversely affect brain vascular dynamics), the expected improvement in oxygenation and hypercarbia upon reduction of alveolar dead space may still be worth the transient side effects of the recruiting PEEP-trial (in terms of cerebral venous return reduction and pCO2 increase). This should though be performed only after ICP-reducing treatments are delivered (sedation, hypertonic saline boluses). As third step, the PEEP trial is performed monitoring respiratory mechanics as reference. For patients with focal loss of aeration, low levels of PEEP (≤ 10 cmH2O) can be tested, under BUS monitoring to promptly detect cerebral hemodynamics disturbances (higher levels of PEEP rarely result in recruitment of consolidations in these patients, and expose normally aerated lung zones to over-distension, with no benefit on gas exchanges at the useless price of increasing ICP). For patients with diffuse loss of aeration (diffuse ARDS), higher levels of PEEP (from 12 cmH2O up) can be tested, still under BUS monitoring. At each increase of PEEP, responsiveness can be monitored by LUS examination of anterior zones ; PEEP is increased by 2–4 cmH2O until anterior zones with moderate or severe aeration loss (respectively separated and coalescent B-lines) become normal (A-lines). Increasing PEEP further to obtain a complete disappearance of B-lines (in lateral zones) or consolidation (in posterior zones) theoretically exposes previously recruited anterior lung zones to over-distension. A semi-quantitative re-aeration score can also be applied in a more exhaustive approach: each intercostal space is examined within each of the 12 regions in both hemi-thoraxes . To apply this scoring method, the most pathological pattern in each region is considered as characterizing the pattern of the entire region. A LUS score of re-aeration would be then calculated, based on the changes of the ultrasound pattern in each region of interest from baseline to end to the recruiting PEEP-trial (a re-aeration score of ≥ 8 has been associated to a CT-scan measured recruitment greater than 600 ml) . The appearance of BUS signs of worsening intracranial hypertension or respiratory mechanics signs of overdistension warrants cessation of the maneuver and ICP-directed medical treatment. The final step consists in the evaluation of the final result of the PEEP-trial. At the chosen PEEP level and after sufficient time for gas exchanges to stabilize, BGA assessment will describe the PaO2 and PaCO2 obtained. Should the new ventilation setting yield no improvement in arterial blood gases, or should this improvement have occurred at the expenses of excessive ICP (persistent BUS signs of elevated ICP), alternative respiratory support strategies [41, 42] or TBI treatments  could be considered. Respiratory and cerebral monitoring are complex parts of critical care. We herewith presented the concept of a combined bedside ultrasound respiratory and neurological monitoring of the neurocritical patient on mechanical ventilation, based on recent evidence suggesting the added value that both techniques represent for bedside monitoring. 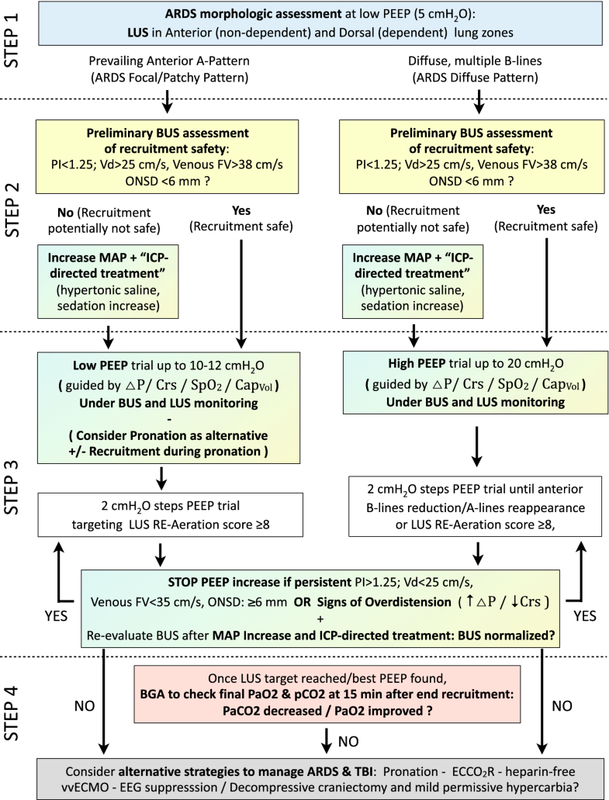 At present, the use of PEEP to treat ARDS in TBI patients may be appropriate; but the decision to increase PEEP in a neurocritical patient should be accompanied by maintenance of systemic arterial pressure and gas-exchange stability, and a close monitoring of cerebral parameters (mainly ICP and CPP). 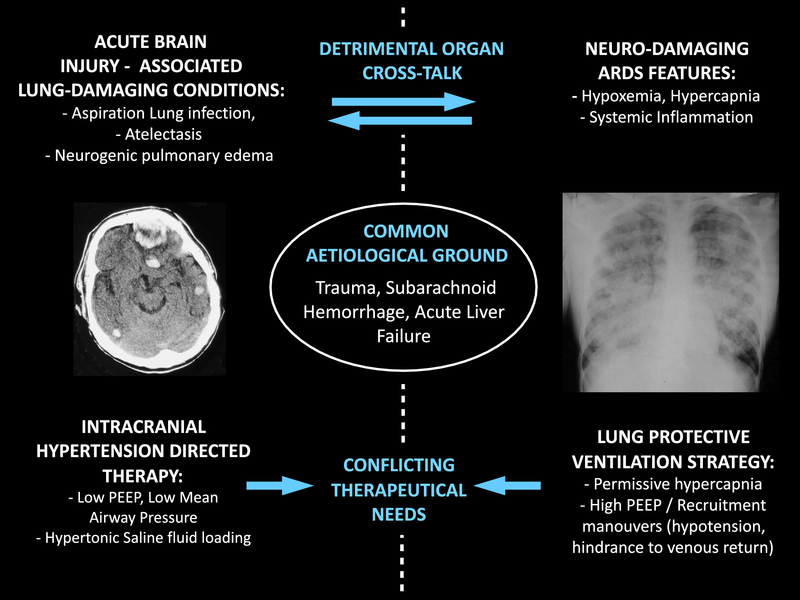 The concomitant combined use of ultrasound for lung and brain monitoring in the challenging setting of co-existing TBI and ARDS could serve the purpose of guiding the ventilator strategy (PEEP setting, recruitment vs. pronation) and of promptly screening for signs of increased/worsening intracranial hypertension (i.e., screening for tolerance to PEEP, to sub-optimal PaCO2). However, LUS–BUS monitoring should be integrated into the well established diagnostic-monitoring workup, including the evaluation of respiratory mechanics, gas-exchange, computer tomography scan and multi-modal brain monitoring. Further research is advocated to validate this ultrasound-aided approach. FC and GV conceived and reviewed the manuscript, CR and GT reviewed the manuscript. All authors read and approved the final manuscript.